A directory of Amish cabins in NY Looking for an Amish-made cabin in New York? Amish specialize in creating quality handmade cabins in a variety of styles. Amish log homes, log cabins, and other outdoor structures can be purchased at a number of locations across the Empire State. Amish log cabin dealers can be found within convenient distance of major NY cities including Rochester, Buffalo, Syracuse, Albany, Utica, Watertown, Binghamton and others. Quality built Amish cabins in a range of styles including two story with stairway and covered porch, Adirondack, two story with large dormer and trapezoidal windows, the Weekender, the Settler and more. A broad selection of log homes in multiple designs available. Each structure can be customized to any specifications. Specializes in Amish-crafted modular cabins such as adirondack, cape cod, frontier, mountaineer, settler and pioneer models. Structures can be used for different purposes, including as a house, office, hunting camp or weekend getaway. North County Storage Barns provides delivery service to Maryland, New Hampshire, New York, Pennsylvania, Vermont, Virginia and West Virginia. Features a wide range of outdoor structures including cabins, hand-built by Amish and Mennonite crew. Different options to choose from such as duratemp T1-11, vinyl, kiln dried board and batten and log siding. Delivery service available. Carries modular cabins, built by Amish craftsmen, among a variety of other Amish structures, including cabanas, gazebos, sheds and garages. Turn-key structures with full basement foundations, appliances, heat and central air conditioning. A range of building options to choose from. Log and timber supply company. A partnership between a non-Amish logging family and Amish manufacturing family. The English half of this business is a family involved in logging and farming since the 1860’s, with the Amish operating a sawmill. Amish hand peeled cabin logs, timber frames, entryways, log cabin accents, logs for cabins and home construction and more available. Amish manufacturers provide a wide range of cabins and cabin-related products in New York. In addition to log homes, log cabins, and other cabin structures, Amish log cabin kits are another popular option for the buyer who doesn’t mind doing some of the work. They also offer the advantage of being more affordable than a pre-constructed log cabin. Some Amish cabin suppliers offer delivery of a fully assembled cabin to your New York state address. With a steadily increasing Amish population, the Empire State’s Plain presence has grown significantly due over the past 10-20 years. Amish people live in approximately 50 locations across New York, from central NY to the far north near the Canadian border, to the Lake Erie region in the west. The entrepreneurial spirit thrives in many Amish communities, and many Amish craftsmen make a living creating wood products and structures such as cabins. Rather than purchase an Amish cabin from a retailer, some prefer to find a local craftsman and buy directly. While not all Amish sell on a retail basis, and while this approach requires more time and effort, visiting an Amish community may provide an alternative way to purchase an Amish-made cabin in New York. A few of the larger Amish communities are listed below. For more info, see our article on Amish in New York. 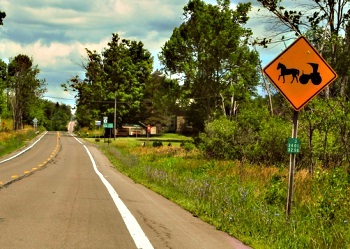 Chautauqua County: Chautauqua County in far western New York is host to 3 Amish communities, the largest of which is found near the towns of Panama and Clymer. Conewango Valley: The state’s largest Amish community, founded in the late 1940s. Around 2,000 Amish live in this community located in Cattaraugus County in western NY. Mohawk Valley: Numerous Amish communities can be found in the Mohawk Valley region of central NY, including near the town of Fort Plain, and in Herkimer and Otsego counties. New York residents: Please verify hours of operation of Amish cabin retailers provided here. Business locations and opening hours can change. As a rule, Amish-owned businesses will be closed on Sunday; however non-Amish cabin dealers may be open. Not responsible for any changes to the above. For cabins in states besides New York, view the Amish cabins main directory page. We would appreciate a proposal based on rough cut timber, log cabin style and standard timber construction options. Hi, we deliver our prebuilt modular Amish built cabins and unassembled cabin kits to NY. Please see www.amishcabincompany.com for our 5 cabin styles and pricing. You can then email us at sales@amishcabincompany.com for a delivered quote to your city/state if you find a model/size you’re interested in our website. Thanks. Our son lives in Ithaca, New York and has land available for a tiny home. We would be interested in finding out more about tiny homes 350-400 sq feet with all amenities included. This would be a place to stay for weeks or months. We would want to know about delivery and what preparation is necessary for the space. A tiny house on wheels is also an option. How do cities treat tiny houses in NY regarding taxes? I’m looking for roughly 30 x 40 cabin, just the shell I can run electric and plumbing and finishing the inside. Do you do this type of work if so can you through me a rough price? The location is in Humphrey my. Is this something you would be interested in. I am located in the Adirondack Mountains in upstate NY about 1 hour north of Albany with excellent access roads.